Curly hair is beautiful, but if you don’t know to manage it, it can be a tricky one to master. Curly hair is more prone to dryness and frizz than any other hair type, and as it’s more temperamental than most, requires that extra level of love and care to keep it soft, smooth and manageable. All hair needs hydration to keep it healthy, but curly hair needs that little bit extra – especially as curly hair should be shampooed less often to stop it getting too frizzy. Use a curl-specific shampoo and conditioner combination, such as Kérastase Discipline Bain Fluidealiste shampoo and Curl Ideal conditioner which is enriched with amino acids, a wheat protein derivative and ceramide R, to smooth and strengthen hair while deeply hydrating and protecting against humidity. Remember to only use lukewarm water when washing curly hair, as hot water will just heighten the risk of it frizzing. We did say moisture was key! When hair is damp or towel-dried, apply a luxurious leave-in conditioner to keep hair smooth and lock in that moisture for days to come. 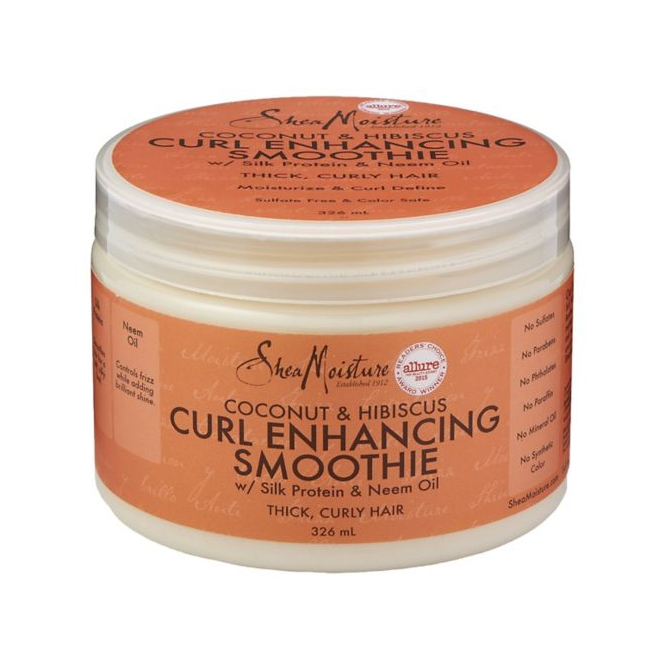 We particularly like the Curl Enhancing Smoothie from Shea Moisture’s Curl & Shine range, which uses natural, organic ingredients such as coconut oil and silk protein, to fight frizz and give you a salon-worthy finished look. The beauty of this product is that it can be used as a styling cream too, so you can use in the days after washing to continue the hydration and protect the hair. We all know the disappointment of going to bed with a beautiful blow-dry, and waking up to a tangled, frizzy mess – but it’s double the trouble when you have curls to contend with. Try the ‘pineapple’ technique before you settle down for the night, to keep curls intact and eliminate the risk of frizz developing; simply tie hair up loosely at the highest point of the head, and secure in place in a pineapple shape. When you take it down in the morning, your volume will still be there and your curls should have kept some shape and body too. Women with any hair type should invest in a silk pillowcase, both for the good of your hair and your skin, but if you have curls, try a silk turban instead. Silke London’s pure silk hair wraps are perfect for curly girls, protecting delicate hair from friction and breakages, for beautifully soft and strong hair. The silk won’t draw moisture away from the hair, and it naturally conditions the strands as it distributes your natural oils from root to tip, meaning you’ll wake with beautifully balanced, soft and silky hair, every morning. Brushes should be banned in curly households; whatever kinds of kinks or curls you’re rocking, you should only be using a wide-toothed comb to tame them. Something like Macadamia Professional’s Healing Oil Infused Comb will work beautifully on curly hair, separating out the curls without causing fluffiness. Remember to comb from the bottom up, working your way up from the tips in small sections rather than combing straight down from the root – it’s much easier to manage tangles this way. When it comes to curly hair, it’s always better to leave it to dry naturally, but we know that’s not always possible. When you do need to dry your hair fast, opt for a diffuser attachment on your hairdryer, which will lift and shape curls to give you a gorgeously bouncy and full finished look. Just remember to use a heat protection spray first, and try not to touch the curls too much as they dry.